I’ve finally done it fellow beauty lovers, I’ve finally subscribed to my first beauty box! 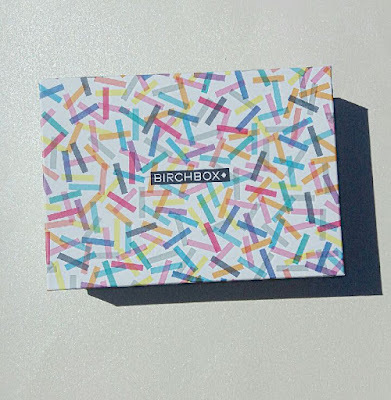 I received my first Birchbox about a week ago and I’m so excited, (in case you couldn’t tell from all of the exclamation points I’m using). I have been wanting to subscribe to Birchbox for a while, but I wasn’t sure if I really wanted to pay $10 a month for beauty samples I might not even want or like. I decided to finally go for it when a survey site I frequently use, Swagbucks, was running a promotion where if I subscribed to Birchbox I would get $15 back in “Swagbucks”. I’m so happy I subscribed to Birchbox, my first box is amazing and I can see myself really enjoying receiving a box of surprise goodies each month. For those who don’t know what Birchbox is, it’s a monthly beauty subscription box, where you receive 5 samples of beauty and skincare products that are fit to match you, using the information you give them. The best part is it’s only $10 and if you like the samples, you can purchase the full size on the Birchbox website. Anyways, enough rambling, let’s get into what I got! I’m so excited to try this shampoo out, I just dyed my hair again and I want to make sure my hair stays a nice, cool blonde and I want to keep those brassy tones out. This shampoo seems like it will be perfect for that and I hope it works! Who doesn’t need an eye make up remover? Nothing is worse than when you can’t seem to get your mascara off. I have high hopes for this eye make up remover, since it says it’s good for waterproof makeup. This is a coral colored stick product that’s supposed to work as a blush and a lip product. I’m not as excited to try this out as some of the other items. I’m not a big fan of cream blushes and I don’t usually wear color on my lips, but I’ll be sure to give it a good try to truly decide if I like it or not. It’s really hard for me to explain scents, but I do like the smell of this perfume. It’s a very refreshing scent. This is a face scrub that’s supposed to mimic the effects of a professional microdermabrasion. Sounds exciting, and I’m always looking for new skincare products so I’m excited to try this out! This was an extra gift if you entered a promo code during check out. Like I said earlier, I’m not a huge lip product person but I did swatch this and it literally stays all day. I used a makeup remover wipe and washed my hands a few times and I could still see some color on my hand. It’s definitely a great product and I’ll probably end up giving it to my sister. That’s everything I got in my September Birchbox! Let me know in the comments if you subscribe to Birchbox and what you got in your box, I’d love to know! I enjoyed my September goodies in my Birchbox and love the reformulated Stila! !